Ideal for replacing a converter/charger that contains an internal fuse panel with a converter/charger that does not. 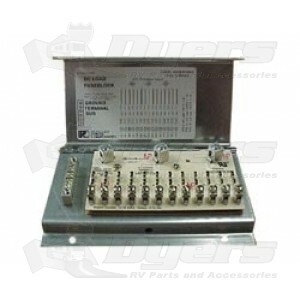 Can be used with Parallax 7400 series or ANY deck mount converter system without "built-in" DC load distribution panel. Wires 15 independently fused DC circuits. Ideal for replacing a converter/charger that contains an internal fuse panel with a converter/charger that does not. Maximum 20A load per circuit (fuses not supplied with unit) with a total capacity of 85 amps. Includes a hinged lid that snaps into place, three DC positive terminals and a chassis mounted ground terminal bus. Three (3) DC positive inputs for converter and battery. Galvanized metal chassis and hinged door. Terminal bar for 12V negative connections. Utilizes standard automotive "blade" style fuses.